A number of research papers have confirmed that VibroGym achieves the benefits of a complete 90 minute strength workout in only 30-minutes. Originally released in Europe in 1999, it began a worldwide revolution in the way training and fitness is delivered. The inspiration for the development of VibroGym WBV originally came from Russian space scientists in the 1960's and 70's who used vibration to maintain the bone density and muscle mass of their cosmonauts. 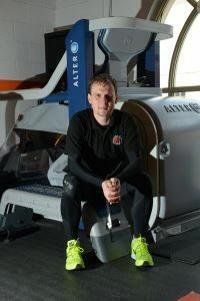 Vibration Training assisted the Russian space programme to set the world record for the longest stay in space at 432 days. In the late 1990's the VibroGym team took this idea and created a unique device for building fitness and wellness that is safe and easy to use - and at the same time suitable for intense professional training. VibroGym WBV has been used in Europe since 1999 and it is the world's most popular vibration platform. Many gyms, personal training studios, chiropractors, physiotherapists and beauty therapists are now using Powerplate. VibroGym WBV works by rapidly vibrating up and down to create extra g-forces on the body. The vibrations also create a reflex contraction of the muscles that produces higher levels of muscle activation than can be achieved in normal exercise. VibroGym WBV only takes up only a small amount of space yet almost any body part can be targeted on the machine by standing, sitting, kneeling, lying, placing your hands on it, as well as an array of muscle relaxation, massage and circulation building functions. Research shows that 15-20 minute workouts on the VibroGym WBV deliver equivalent benefits to one-hour of conventional training and can improve body toning, accelerate fat loss, reduce cellulite, flatten the abdominals, create muscle relaxation, improve circulation and improve flexibility. 'Dan isn't the first personal trainer I have used but he is by far the best! He keeps me motivated throughout my sessions with him and I always feel great afterwards.